Future oceanic conditions induced by anthropogenic greenhouse gas emissions include warming, acidification and reduced nutrient supply due to increased stratification. Some parts of the Southern Ocean are expected to show rapid changes, especially for carbonate mineral saturation. Here we compare the physiological response of the model coccolithophore Emiliania huxleyi (strain EHSO 5.14, originating from 50oS, 149oE) with pH/CO2 gradients (mimicking ocean acidification ranging from 1 to 4 × current pCO2 levels) under nutrient-limited (nitrogen and phosphorus) and -replete conditions. Both nutrient limitations decreased per cell photosynthesis (particulate organic carbon (POC) production) and calcification (particulate inorganic carbon (PIC) production) rates for all pCO2 levels, with more than 50% reductions under nitrogen limitation. These impacts, however, became indistinguishable from nutrient-replete conditions when normalized to cell volume. Calcification decreased three-fold and linearly with increasing pCO2 under all nutrient conditions, and was accompanied by a smaller ∼30% nonlinear reduction in POC production, manifested mainly above 3 × current pCO2. 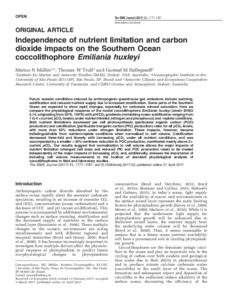 Our results suggest that normalization to cell volume allows the major impacts of nutrient limitation (changed cell sizes and reduced PIC and POC production rates) to be treated independently of the major impacts of increasing pCO2 and, additionally, stresses the importance of including cell volume measurements to the toolbox of standard physiological analysis of coccolithophores in field and laboratory studies.